HINXTON, (UK), September 2018 — Adult humans have many more blood-creating stem cells in their bone marrow than previously thought, ranging between 50,000 and 200,000 stem cells. Researchers from the Wellcome Sanger Institute and Wellcome – MRC Cambridge Stem Cell Institute developed a new approach for studying stem cells, based on methods used in ecology. The results, published September 5 in Nature, present a new opportunity for studying, in humans, how stem cells throughout the body change during aging and disease. Using whole genome sequencing to build and analyze a family tree of cells, this work could lead to insights into how cancers develop and why some stem cell therapies are more effective than others. Blood stem cells drive the production of blood, and are used in treatments and therapies such as bone marrow transplantations. However, blood stem cells in humans are not fully understood, with even some of the most basic questions, such as how many cells there are and how they change with age, not yet answered. In the study, researchers conducted whole genome sequencing on 140 blood stem cell colonies from a healthy 59-year-old man. The team adapted a capture-recapture method, traditionally used in ecology to monitor species populations, to “tag” stem cells and compare them to the population of blood cells. Current methods for measuring stem cell population size typically involve genome engineering, meaning they are limited to model organisms, such as mice. By analyzing naturally-occurring mutations in human cells, researchers can use the accumulation of mutations to track stem cells to see how stem cell dynamics change over a person’s lifetime. 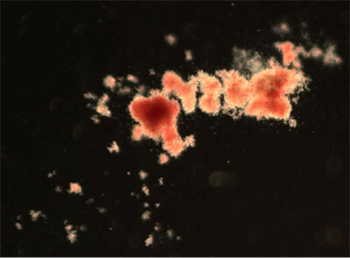 A blood cell colony grown from a single cell isolated from a 59-year-old man. Image courtesy of Mairi Shepherd, Kent Lab.